Small businesses are as diverse as the consumers they serve. They also face many of the same challenges about how to spend, save, borrow and plan. Which is why, at Intuit, we believe it’s important to closely understand and study customer pains, which in turn leads to deep customer empathy. As the head of Intuit’s Small Business and Self-Employed Group, I’m tasked with maintaining our strong customer focus to design solutions that ultimately help business owners achieve financial health. 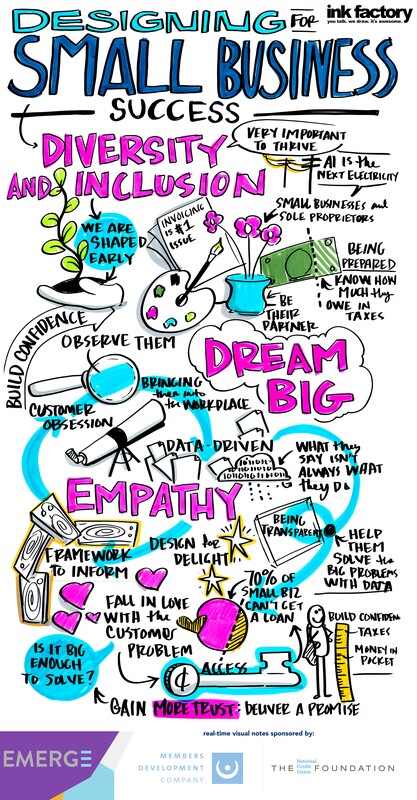 This is why I was thrilled to talk about Designing for Small Business Success at The Center for Financial Services Innovation’s (CFSI) Emerge 2018 Forum. Here are a few highlights from my on-stage conversation with Gina Harman, CEO of Accion’s U.S. Network. We always start with the customer problem we’re solving for and get really specific. With our customers’ permission, we study them where they are most comfortable: their homes or their businesses. We call these Follow Me Homes. We also bring customers into the workplace to test prototypes. Our approach has always been to be as obsessed with our customers as possible. We dig deep, ask a lot of questions, including tough ones to really pinpoint the pain points. By keeping customers at the center of our focus, we are able to turn insights into solutions that help small businesses and the self-employed survive and thrive. For example, one discovery that came from customer interviews was that many self-employed have a unique problem of mixing their business and personal expenses. The response from customers who now have access to features like automatic mileage tracking, real-time expense tracking, and receipt capture in a snap is overwhelming. For some, the ability to manage personal versus business expenses has been life-changing. But we don’t just stop with customer interviews. What customers say is not always what they do. So, we look at data to better understand customer behavior, always with our mandate to Design for Delight in mind. We also harness data to empower customers and deliver the products they need. One of the findings we discovered from analyzing data is that over 70% of small businesses cannot get a loan, in part, because the Financial Institution doesn’t have enough income data to extend them credit. We can help small businesses access capital by using their QuickBooks data to demonstrate their financial assets such as cash flow and customer credit histories. This opens up new opportunities for the 70% of small businesses who typically could not get a loan and for financial institutions that are eager to serve small business capital needs. Another new emphasis of ours is to learn from business owners during their biggest time of need and to help them prepare for disasters. We recently sent a team into the field to talk with customers who experienced the Napa California fires and Houston floods last year. That last data point stating that nearly half of all small businesses never reopen after a major disaster is chilling. My goal is to help small businesses and self-employed to be successful even in the midst of a disaster, coming out of the eye of the storm still intact and able to continue doing what they love to do. We’ve learned a lot from our customers who went through the Napa and Houston disasters, and we also learned that there were things we could do to help, such as waive subscriptions and delay QuickBooks Capital repayments for our affected small businesses. What excites me most is putting more money into our customers’ pockets. This happens in a variety of ways, but most importantly it’s delivering on the basics of our mission to create new products and deliver awesome experiences for their customers that ultimately help small businesses and the self-employed around the world. Sasan Goodarzi is executive vice president and general manager of Intuit's Small Business Group.